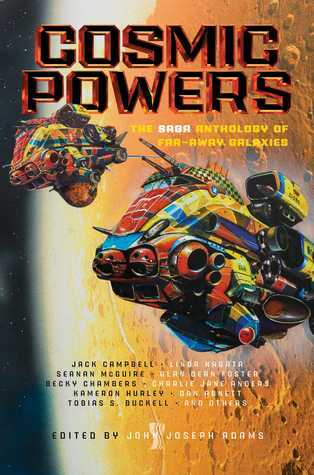 The new John Joseph Adams-edited anthology, Cosmic Powers, is the first great anthology of the year, jam-packed with smart, entertaining sci-fi adventure stories that bring a nicely modern sensibility to old ideas and tropes. There are several recurring themes throughout the anthology. Religion figures largely in many of these stories, and several of the stories deal with gods or with beings who have amassed nearly godlike power with the aid of time and technology. Artificial intelligences of various kinds make several appearances, as do post-humans of multiple kinds. Examinations of families both biological and found are significant as well, and several stories look at the responsibility of people to each other, personally, and to humanity as a whole; it’s “the personal is political” writ across space and time. It’s a remarkably cohesive collection that nonetheless contains a wonderful variety of stories by a diverse group of authors to offer a well-rounded perspective on the idea of stories that take place on a cosmic scale. The collection kicks off on a strong note with Charlie Jane Anders’ very clever, very funny adventure story, “A Temporary Embarrassment in Spacetime,” and Tobias S. Buckell’s “Zen and the Art of Starship Maintenance,” which is at least as clever as its predecessor, telling the story of a maintenance robot’s creative circumvention of its own programming. 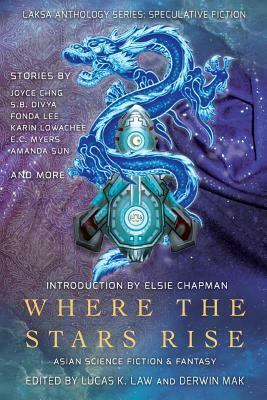 It’s seldom that any anthology starts off with three knock-out stories in a row, but these two are followed up with Becky Chambers’ “The Deckhand, the Nova Blade, and the Thrice-Sung Texts,” a delightful epistolary exploration of the Hero’s Journey from the perspective of an unlikely Chosen One. The next three stories aren’t as good. Vylar Kaftan’s “The Sighted Watchmaker” is fine, and I’m sure it will be appealing to those who enjoy this kind of thing, but it wasn’t for me. It lost me with the Richard Dawkins epigraph and never quite managed to recapture my interests. I had already read “Infinite Love Engine” by Joseph Allen Hill in a recent issue of Lightspeed, but rereading it didn’t help me “get” it any better than I did the first time. I want to love the sheer weirdness of it, but it verges on a degree of psychedelia that makes it difficult to nail down exactly what the story is about. Still, I expect this is a story that I’ll return to again; I think maybe I just need to read it the right way and it will all make sense. “Unfamiliar Gods” by Adam-Troy Castro, with Judi B. Castro, is a mostly straightforward deal with the devil story, played for laughs and with an absurdist “twist,” but it’s not particularly funny or thoughtful. Caroline M. Yoachim’s “Seven Wonders of a Once and Future World” covers some of the same thematic ground as “The Sighted Watchmaker,” but more effectively and with an interesting story structure that works well to break up Yoachim’s big ideas into easily digestible portions. “Golden Ring” by Karl Schroeder and “The Universe, Sung in Stars” by Kat Howard similarly work with ideas relating the nature of god and time, but neither of these approach the excellence of “Seven Wonders.” The Kat Howard story is beautifully written, but all the lovely, poetic prose in the world isn’t enough to make up for a somewhat trite premise. From Alan Dean Foster comes the workmanlike but ultimately anti-climactic “Our Specialty is Xenogeology,” in which a Star Trek-ish team of space explorers almost make first contact but then think better of it. I expected to love A. Merc Rustad’s “Tomorrow When We See the Sun,” having liked all the previous work of theirs that I’ve read, but I didn’t. (Still can’t wait til I get my copy of their first short fiction collection, though. 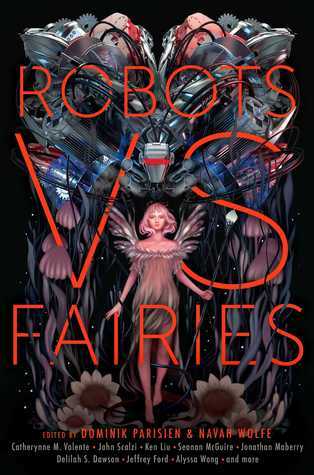 So You Want to Be a Robot and Other Stories came out May 2 from Lethe Press.) I barely remember Jack Campbell’s “Wakening Ouroboros” and Dan Abnett’s “The Frost Giant’s Data,” and together with the sadly unremarkable Kameron Hurley tale, “Warped Passages”—which is only notable due to its seeming connection to Hurley’s excellent space opera, The Stars Are Legion—they made for a finish to Cosmic Powers that wasn’t nearly as strong as its start. Fortunately, there’s still a few more excellent stories tucked in the middle. Seanan McGuire’s “Bring the Kids and Revisit the Past at the Traveling Retro Funfair!” is a cool, fun adventure with some high stakes. It’s perhaps a little too tidy, but I’d definitely be down to read the continuing adventures of these characters as a novel. Linda Nagata’s “Diamond and the World Breaker” has a similar tone and similarly high stakes, and I loved the exploration of the mother-daughter relationship between Diamond and Violetta. As the current parent of fourteen-year-old girl, I found the conflict relatable, and Nagata does a good job of capturing some of the frustration and joy of watching one’s child grow up. Sandwiched between these two stories is “The Dragon the Flew Out of the Sun” by Aliette de Bodard, a thoughtful musing on the long-term ways that war damages communities and families. It’s the story in the book that is least like any of the other stories collected here, but it resonates in a compelling way with the stories that immediately precede and follow it. Finally, there’s a new Yoon Ha Lee story, “The Chameleon’s Gloves,” set in his Hexarchate universe but offering a very different perspective than what has been seen of that world so far. Before now, the Hexarchate stories have been very concerned with specifically military stories, with a lot of focus on the complex calendrical mathematics that fuel the Hexarchate’s technology, but “The Chameleon’s Gloves” is a bit smaller, more personal story centered around a character who is something of an outsider to all of that. It’s not my favorite thing Lee has ever written, and if you really want to get a good idea of his oeuvre you ought to pick up his superb 2013 collection, Conservation of Shadows, but it’s a great place to start, especially if you’ve only read Ninefox Gambit and not any of Lee’s short fiction. Ellen Klages is having a good year, which is also a boon for those of us who love good short fiction. Klages’ Tor.com novella, Passing Strange, is sure to be among the best of 2017, and it was a fortuitous discovery for me as I hadn’t read anything by Ellen Klages before. When I saw that she had a new collection of short fiction coming out from Tachyon just a couple of months later, I was thrilled. I was even more thrilled when I got approved for the ARC on NetGalley, and my excitement turned out to be totally warranted. 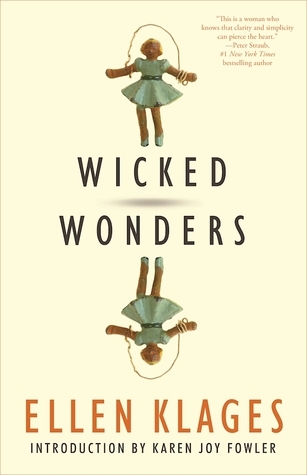 Wicked Wonders is, with one significant and honestly baffling exception, full of consistently thoughtful, clever, affecting stories, all overlaid by a sort of gently reassuring feeling of nostalgia. The only major criticism I have of the collection specifically concerns the story “Woodsmoke,” which starts off as a nice story about girls bonding (maybe even falling in adolescent love) at a summer camp but then turns into the horrendously sensationalized reveal that one of the girls has an intersex condition, complete with immediate misgendering and melodramatic handwringing about “I don’t know your real name.” It’s a bizarre bait and switch that feels like a betrayal of the characters (who deserve better treatment) and the spirit of the story (which up to that point was fine, if unremarkable). Frankly, I don’t know what Klages was about with this story, and her explanation of it in the Story Notes section at the back of the book is unhelpful except to say that she hopes to make it part of a novel length work at some point (please no). If “Woodsmoke” had appeared early in the collection, I may have stopped reading the book altogether because it was so deeply upsetting; as it is, I can only recommend Wicked Wonders with a major reservation. Regarding the rest of the collection, many of the stories in Wicked Wonders deal with childhood, and Klages has a real knack for capturing something of the bittersweetness of coming of age moments. “The Education of a Witch” explores a young girl’s identification with a villainess, and it’s a story that will likely be relatable, albeit in different ways, both to those of us who grew up before princess culture and those who grew up immersed in it. “Singing on a Star” is looks at the anxieties that surround a child’s first sleepover. Often, Klages’ stories feature precocious girls with creatively clever and interesting ways of looking at the world, as in “Gone to the Library” (which also features a cameo by Grace Hopper). Most of these stories deal with transitions of one kind or another. In “Amicae Aeternum” (a story which legit made me weep when I read it and is literally making me tear up as I write this), a young girl says goodbye to her best friend before moving very far away. “Echoes of Aurora” is a gorgeously melancholy autumnal love story that deals with a non-childhood life change. “Hey, Presto!” is a smart and thoughtful coming of age story about a young woman reconnecting with her father and discovering they have more in common than she previously thought. In “Goodnight Moons,” a story that that recalls nothing more than Bradbury’s Martian Chronicles, an astronaut takes a much bigger leap for humanity than she thought she was going to when she signed up to go to Mars. Also evident in this collection is a sharply wry sense of humor, and Klages often uses ironic turns of phrase and sly references to great effect. “Sponda the Suet Girl and the Secret of the French Pearl” is a smart and funny original fairytale that should appeal to fans of Ursula Vernon. “The Scary Ham” is a short, humorous nonfiction story about the grieving process (and it was a very scary ham). “Mrs. Zeno’s Paradox” carries social nicety between women to a logical extreme, making use of a single strong central joke for maximum effect. To be sure, there’s a decided slightness to all the stories in this collection, which is sometimes at odds with the ostensibly serious subject matter Klages writes about. While there is a little darkness in some of the stories, Klages’ endings are almost universally happy, or at least optimistic, and I suspect this won’t appeal to all readers. Still, there’s something to be said for short, sweet stories that don’t require a great deal of thought to understand and enjoy, and Wicked Wonders, for the most part, has a pleasantly restful quality that makes it quietly delightful to read. This review is based on an advance copy of the title received from the publisher via NetGalley.